The Reznor ZQYRA Series dedicated outdoor air system (DOAS) combines control design with modulating heat pump and enthalpy wheel technology. 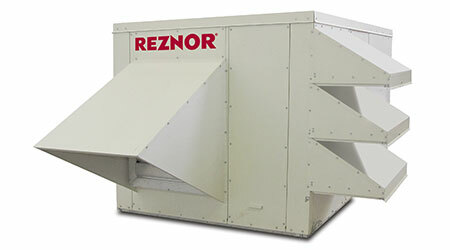 The ZQYRA–8 (500 to 1,100-CFM) and ZQYRA–12 (900 to 1,500-CFM) units boast one of the HVAC industry’s smallest DOAS footprints and are ideal for adding outdoor air ventilation in smaller spaces for new and retrofit VRF or conventional DX air conditioning projects. The ZQYRA Series surpasses AHRI Standard 920’s dehumidification efficiency minimum 5.2 ISMRE rating. Although both models are 3.5-tons, their silica gel enthalpy wheels’ dehumidification benefit effectively equals that of a 7-ton air conditioner. The Series also surpasses minimum requirements for ASHRAE Standards 62.1, 90.1, 189.1 and LEED project mandates for 30-percent more ventilation air while using 30-percent less building energy. Unlike large capacity DOAS systems with a myriad of options that complicate the specification process, the ZQYRA design offers a simplified approach with only basic options. Options include MERV 8 or MERV 13 filtration; corrosion-resistant coil coatings for salt water locations; and activation control options ranging from CO2, occupancy, and VOC sensors, or a manual on/off override switch; power requirements of 208/230 or 460V power. The ZQYRA Series also offers greater than 9.0 COP and greater than 17.0 EER. – Z-Series Selection software’s data sheet is printable for client specification presentations.